Despite recent progress in global health, poor populations in low- and middle-income countries continue to suffer and die disproportionately from poverty related and neglected diseases (PRNDs). For many of these diseases, new medicines, vaccines, and diagnostic tests are urgently needed. However, the lack of market incentives is a major barrier to research and development (R&D) for such health technologies. Governments and philanthropic foundations have helped to address this gap by funding product development for PRNDs. In a new study that we published yesterday, we focused on one important government funder of such product development: the United States government. Our study, called “Strengthening the United States Government’s Role in Product Development for Global Health,” conducted in collaboration with other colleagues in the Duke Global Health Institute and at the Duke Margolis Center for Health Policy, was commissioned by the Global Health Technologies Coalition. Barriers and catalysts to such investment. In 2015, the U.S. government invested US$ 1.7 billion in global health product development, making it the largest government investor in such R&D. Overall, the U.S. government was responsible for about three quarters of all government funding invested in global health product development in 2015 (Figure 1). Our study found that the U.S. government directs twice as much R&D funding to basic and early-stage research as to late-stage product development. This prioritization is explained by the fact that 80% of all U.S. government funding for global health product development goes to the National Institutes of Health (NIH), which focuses on early-stage research. In terms of disease-specific investments in 2015, HIV/AIDS received 45% of the total funding, followed by Ebola and other African viral hemorrhagic fevers. 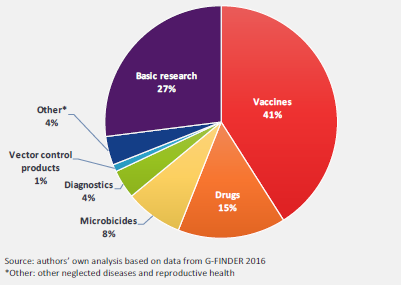 In terms of research type, 41% of funding was directed at vaccine research, 27% to basic research, and 15% to drug research (Figure 2). 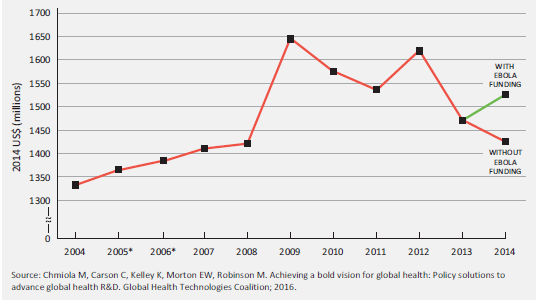 A striking finding in our report is that U.S. government global health R&D investment has been falling since 2012, except for a funding surge for Ebola in response to the 2014 West Africa outbreak (Figure 3). 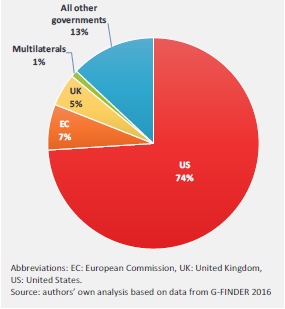 A deeper look at the investment profile of the U.S. government pointed towards some serious challenges, including the absence of an overarching global health R&D strategy, institutional siloes, under-used agency resources, and inadequate market incentive structures. Key informants argued that although the appropriations and budget process is complex, it is instrumental in determining the resource envelope for global health R&D. Although barriers exist in allocating funding to global health R&D within the U.S. government, many innovations and initiatives have helped to facilitate and attract more investments from both the private sector as well as the non-profit world. Cross-agency collaborations such as the Grand Challenges, market incentive mechanisms such as the priority review voucher, and other regulatory and legislative changes have facilitated the flow of more funding into global health R&D while also encouraging cross-sector collaboration. Key informants acknowledged that Congress is a major catalyst for pushing these legislative and regulatory reforms. The interviews with for profit and non-profit key informants provided important insights to some of the institutional mechanisms and approaches that can help attract more investments to global health R&D. The industry informants specifically highlighted the need for better incentives and market driven mechanisms along with faster regulatory approval processes to attract greater private investments. The informants from the non-profit sectors called for greater knowledge sharing, a push for translational research funding, and more cross-agency and cross sector collaborations for product development. Expand and replicate successful mechanisms that encourage the private sector to develop and bring new innovations to market, and better leverage under-used R&D capacities within the U.S. government, such as health research capabilities of the U.S. Department of Defense. Strengthen the U.S. government’s collaborations with other actors in the global health R&D space, including through greater participation in and funding of global public-private partnerships for product development. Adopt uniform definition of global health R&D across U.S. government agencies to allow for better tracking of funding flows and inform strategic prioritization of activities. Support research driven by low- and middle-income countries, and advance capacity building programs to improve the ability of these nations to invest in, develop, and approve new, appropriate technologies that meet domestic health needs while creating a more sustainable model for financing health R&D. Refining and implementing these solutions will require continued engagement with U.S. policy makers, and advocacy efforts that emphasize the return on investment, both in the U.S. and abroad, for global health R&D.